Aside from the naval attempt to force the Strait of the Dardanelles, the Battle of Jutland was the largest naval engagement of the First World War. Unlike the Second World War, the First did not see the pitched battles between fleets, such as those between the American and Japanese navies. Part of this was a desire on the German side to avoid engaging the British Royal Navy at all, since it was at the time the strongest navy in the world. While the Germans made frequent use of submarines to sink Allied shipping to Europe, aside from Jutland there were really no large scale naval engagements for the duration of the war. Unfortunately for both participants, Jutland ended with no clear victory and both Germany and Britain claimed to have been the winners, and in Germany 31 May continued to be celebrated with victory parades well into the 1960s. On the British side, Admiral Prince Louis of Battenburg commissioned a medal to commemorate the victory, which was made available in late 1916 and purchased through Spink and Son Ltd. The CCGW collections hold one of these medals in its original box, along with the certificate of authenticity that accompanied it. 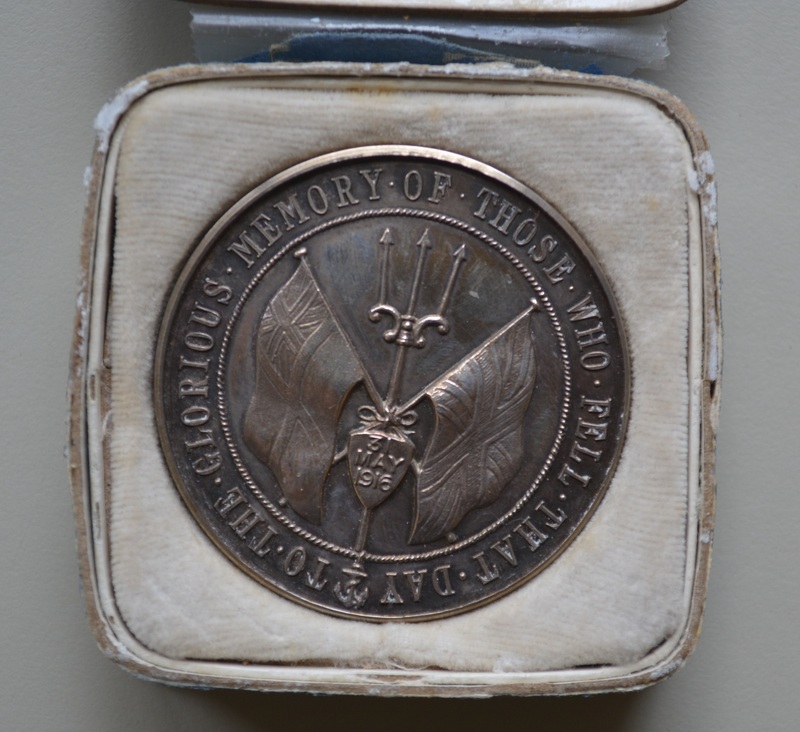 All proceeds were to be given to Naval Orphanages, which is also noted in the certificate, and the medal was marketed as “a striking contrast to the Kaiser’s medal issued to commemorate what he called the “gallant bravery” of his “glorious Navy” in bombarding the [defenceless] town of Scarborough”. The medal was available in three sizes in three materials for three difference price points, ranging from 1 shilling to 15 shillings; those wishing to purchase it could go directly to the Spink shop on in Piccadilly. Like the Lusitania medal I featured earlier on this blog, the Jutland medal was also a propaganda tool. In the public eye, those who claimed the victory were the victors, regardless of the technical definition of who the winner actually was. Despite the public claim of victory, Jutland remained a controversial battle within the Admiralty. Admiral Jellicoe, who was responsible overall for the way the battle had been fought, was thought to have hesitated too much and to have allowed the German navy to escape in the night instead of taking the decision to pursue them. His critics, including Winston Churchill, thought him indecisive, though with the loss of 14 ships in comparison to the German losses of 11 it is understandable that Jellicoe would not have wanted to risk the rest of his fleet. A failure of that size could have effectively ended the British superiority on water, which, after Gallipoli, was somewhat shaky to begin with. It is not know how many Canadian sailors took part in the battle; as enlistees with the Royal Navy they would not have been separated by nationality. There was one Canadian casualty listed on the HMS Indefatigable, Engineer-Lieutenant Stanley N. De Quetteville. One of Canada’s Victoria Cross winners, Lt Frederick Thornton Peters, sailed on the HMS Meteor and was involved in the earlier Battle of Dogger Bank, which preceded Jutland. Peters enlisted directly with the Royal Navy and was awarded the DSO for his actions at Dogger Bank; a career navy man, he received the Victoria Cross in 1942 after trying to force the boom defences in the harbour of Oran. Peters was killed in a plane crash while on his was to Britain to collect his award.